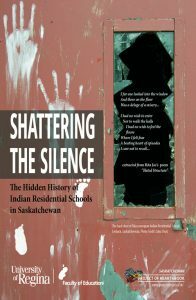 In November, the Faculty of Education Tweeted this statistic: Only a few months after being published, the Shattering the Silence: The Hidden History of Indian Residential Schools ebook had 12,453 worldwide visitors to the ebook site. Since then the site has had 22,494 visitors! The word is spreading, thanks to opportunities at the U of R for Shuana Niessen to present about the book as well as the feature in Discourse Magazine. The next presentation will be at the Regina Public Schools Teachers’ Convention, which will be held on February 16. The session already has 82 people signed up! If you haven’t already, be sure to visit the site with a view to using the resource in whatever sector you work. Though the ebook was written with teachers in mind, and thus curricular links are available, it is useful for learning about Indian residential schools in Saskatchewan and can be of use for understanding many of the issues affecting society today. Saskatchewan Indian Institute of Technology ran with Project of Heart — and their running partner was…. a class of elementary students at Lady Evelyn Alternative School in Ottawa! How did that happen? SIIT is located on the Asimakaniseekan Askiy Reserve in Saskatoon and Kathleen Worm is their Manager in Workforce Development. Kathleen hosted Project of Heart for over 90 IRS Support Workers gathered in Saskatoon for a conference. What was unique about this Project of Heart workshop is the way in which the participants were supported in carrying out the social justice action. Help came from a class of Grade 3 and 4 students in Ottawa who are part of their Shannen’s Dream Club. These students made 91 beautiful post-cards, all decorated to depict their vision of what reconciliation for First Nations children on reserves in Canada would look like. The backs of the post-cards are labelled with Prime Minister Justin Trudeau’s address. The Support Workers did the rest of the work – writing what they want the Prime Minister to do to address the inequities: namely, to implement the Canadian Human Rights Tribunal’s orders to fund First Nations children on and off reserve equitably to their non-Indigenous counterparts. The POH workshop participants in Saskatoon were able to skype in to Ms. Fontaine’s class to thank the children for their solidarity with Indigenous children. They made a heart-felt connection with the 8, 9, and 10 year olds that partnered with them in their social justice action! Danielle Fontaine’s Grade 3 and 4 class in Ottawa ON learn about more than the abc’s of education; they learn the abc’s of Canada’s history and the abc’s of compassionate humanism. Danielle has been incorporating First Nations issues in the classroom for over 6 years now and the result is nothing short of loving. Teaching compassion first, Danielle’s students then learn to empathize with the current peril of First Nations children across Canada. Shannen’s Dream, a powerful show of advocacy by a young First Nation girl wanting a school for her community was one of the stories that the students learned of. 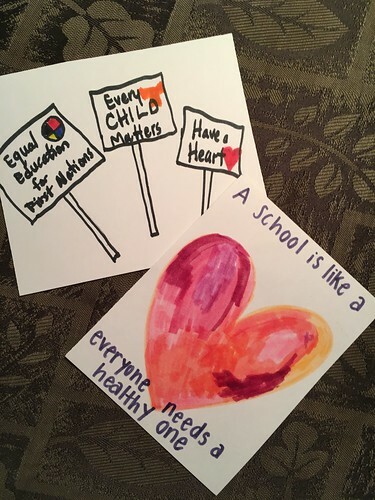 In a show of support and activism, the 8, 9 and 10 year olds designed post cards with messages and images reflecting their mind and heart on the issue of First Nation children’s educational rights. These postcards are all addressed to Prime Minister Justin Trudeau. The Saskatchewan Resolution Health Support Workforce, the emotional and cultural supports offered to survivors going through their independent claims and hearings, gather twice a year for professional development. This past gathering in January had approximately 90 of the post cards designed by Ms Fontaine’s class. Using these postcards, messages were sent to the Prime Minister on many issues surrounding First Nations people. To further strengthen the impact and the shared understanding, the RHSW Gathering skyped into the Grade 3 & 4 classroom in Ottawa. The excitement and joy was palpable. The opportunity to let those children see the impact of their own efforts and for the aging group of survivors to see hope for the future as young ones are taught the truth and are willing to fight for what’s right. Thank you Kathleen and all the IRS Survivors who met their supporters for doing Project of Heart and sharing themselves with their young fans in Ottawa. The Government will continue to be challenged as long as Canada has youth who are passionate about fair play. Their message is clear. Format: This 4-day event will include two panels from faculty on topics associated with Missing and Murdered Aboriginal Women. The symposium will also include a student panel and a World Café Event. The World Café (March 27 @ 9-3). This day-long event will encourage discussion, creativity, and action planning with individuals committed to social action. We imagine participation from members of the university community (staff, students and faculty) as well as the larger community of Regina and area. Call for Presenters: Three 1-hour panels will be offered from March 24-26 (details below). Each panel will have 4-5 presenters. Each presenter will have 10 minutes to present. Presenters are invited to be creative (engage participants in an activity that you do in class; tell a story; offer a photo essay; or use power point or other tools). Missing and Murdered Aboriginal Women in the Liberal Arts? Missing and Murdered Aboriginal Women in the Professional Programs? Missing and Murdered Aboriginal women in our undergraduate and graduate studies? A student panel.